Cikgu MIDAD's missADVENTURES....! : FLY TO SEOUL, BUSAN AND JEJU...! You can reach South Korea from Malaysia via a few airlines. Your destination can be Incheon (Seoul) or Gimhae (Busan). 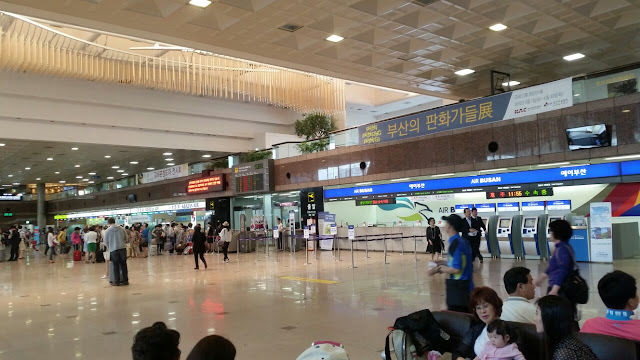 You can go to Gimpo Airport in Seoul from Incheon by Arex commuter train. It takes about 35 minutes and costs 3350 Won. Then from Gimpo (Seoul) or Busan, you can take a flight to Jeju Island. There are direct flights to Korea and others that you need to stopover for a couple of hours. Malaysia Airlines, Air Asia and Korean Air have direct flights to Korea. It takes about 6 hours to reach the country. Korea is one hour ahead of Malaysia. Vietnam Airlines, China Eastern, Thai Airways and Cathay Pacific requires you to stopover at certain airports. Many Malaysians either take Malaysian Airlines or Air Asia, which is usually cheaper. You have to book in advance if you want to secure a low fare. If you search the airline websites often and try different dates, you may get cheaper flights! Let say you're going on a holiday from 28/11/16 to 4/12/16. If you book with Air Asia, you will have to pay RM 1163 to RM1493 for return tickets. You will depart from KLIA2. If you book with Malaysian Airlines, you will have to pay RM1987 to RM2219 for return tickets. You will depart from KLIA. If you book with Korean Air, you need to pay RM2444 to RM3036 for return tickets. You will depart from KLIA. - cheaper flight of course! - you can travel to Incheon or Busan. There is no direct flight to Jeju from Malaysia, so you can either fly from Busan or Gimpo (Seoul) once you reach South Korea. Some of the airlines that fly to Jeju are Korean Air, Asiana Air, Jeju Air and Jin Air. It takes 65 minutes from Gimpo to Jeju and 55 minutes from Busan to Jeju. My sister, her friends and I went to Jeju in June last year. We bought our own Air Asia ticket a few months earlier so that we could get cheaper fares to Busan. 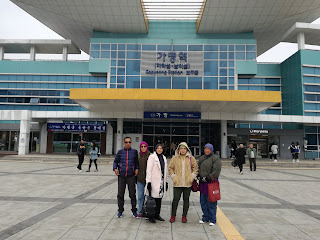 We didn't have to buy the domestic flight tickets to Jeju ourselves since it was already included in the ground tour package by JejuTnT (Jeju Tour and Travel). The tour was handled by a Malaysian, Ghani Salleh @ Wak who also acted as our guide and chauffeur! Another Jeju tour you could try is handled by Kina Omar. You can search their Instagram accounts for latest offers and packages. Next topic : Jeju Island Rendezvous.....!